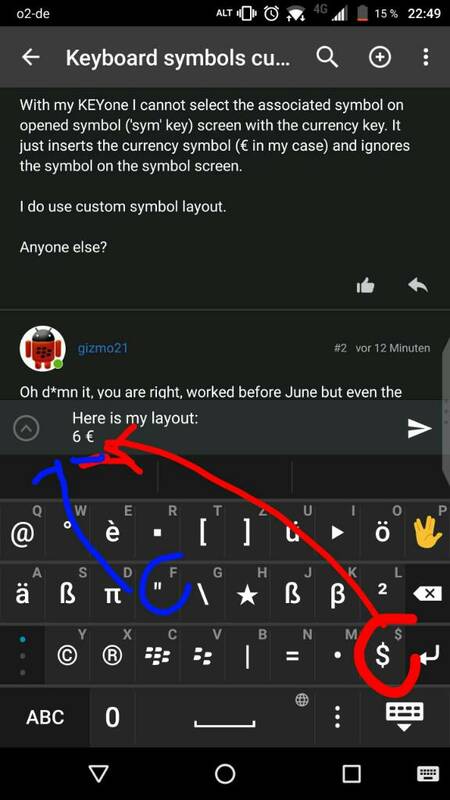 With my KEYone I cannot select the associated symbol on opened symbol ('sym' key) screen with the currency key. It just inserts the currency symbol (€ in my case) and ignores the symbol on the symbol screen. I do use custom symbol layout. Oh d*mn it, you are right, worked before June but not even the second June update from yesterday v.11755 does fix it. F does type 6 instead of my: "
And sometimes other keys too, but those two are always wrong. @LiamQ and @Colin Ho please add this to your "to fix" list. Last edited by gizmo21; 06-30-17 at 03:56 PM. Have to say currency hardware key is € originally on my QWERTZ, so the custom sym layout can't change that currency to something different. Last edited by gizmo21; 06-30-17 at 04:07 PM. hm some inconsistency here since it works on mine (custom layout, same setup for $ as gizmo21, DE pkb)... in this case, mine outputs $ as supposed to. Tried device restart, cache clean, set the currency on costum symbols again but non of it fixed it. I changed "currency symbol" in prefs and then always this new symbol is used no matter if pkb currency key directly or with SYM. I changed custom layout on "F" key from " to # and that worked, so there is something wrong only when " is set to F and then displays 6. So I can't fix it with today's new version of BlackBerry keyboard. Last edited by gizmo21; 06-30-17 at 04:52 PM. It did work on my KEYone when I picked it up in May. It also used to work pressing the currency key with 'alt' modifier for alternative currency (in my case $) instead of standard €. I have the same problem with custom layout '&' on 'J'. It displays ';' instead. Other symbols on 'J' work just fine. So it seems that some key/symbol combinations ignore the symbol layout and output their native alt modifier symbol instead. It's even worth for '&' on 'J' since it is standard layout. I have QWERTZ, DE PKB. Currency bug also still persits in August update. Thx for testing it on beta release, as I only use finals (which is still June). Just PMed it to BlackBerry stuff as it seems @ mentioning of last post did not get their attention. Seems it only bugs some of us QWERTZ / de_DE users atm. J and & bug still there on custom layout. Not on the standard though. what is the recommended music player for key one? Anyone wish the KEYᵒⁿᵉ had three row keyboard.